Hiding behind the double-knits, cored-out earflap and lazy wrist twirl was the harsh reality that man is mortal and everything is going to end. Carl Yastrzemski’s immediate predecessor, Ted Williams, lived some kind of charmed life where he could accomplish whatever he wanted to through the sheer force of being Ted. He was a 6’ 3” live wire, a bulldog Picasso or Hemingway with a bat. Yaz? He was you or me, some guy who wouldn’t get two glances on the street, but was somehow able to push himself to the very limits of what he could do and live out there in that ether for 23 years. If Ted Williams was Superman, some freakish alien life form given powers by the yellow sun, then Carl Yastrzemski was Batman, a human residing on the edge of his own capabilities because that is what he was driven to do. Williams left us by hitting a home run in his last at-bat, still lifting that car as effortlessly as he did on the cover of Action Comics #1. 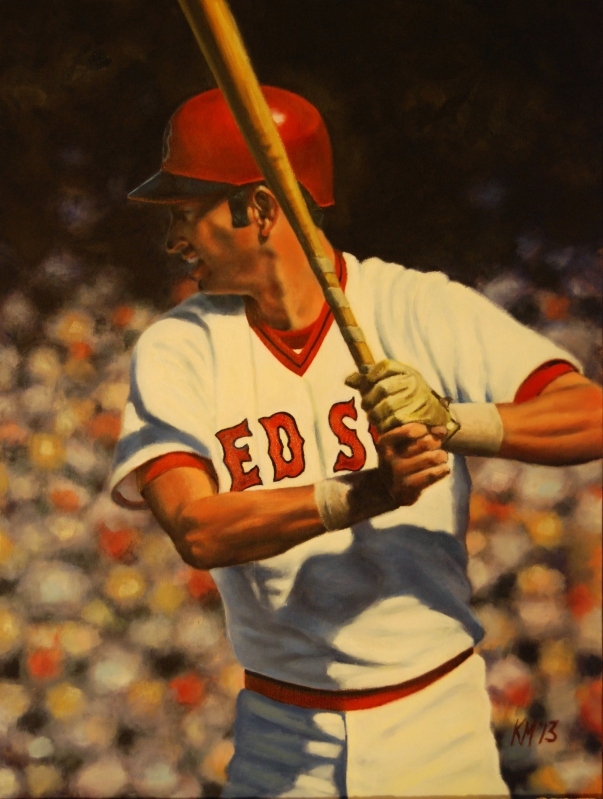 Yaz, on the other hand, bore the visible scars of battle, ones dealt not only by foes on the diamond but by time itself. And because of this we identified with him all the more. I was 12 when Yaz’s Batman avatar began to pixelate and break down, revealing its ugly underneath, a marker of the passage of time. Here he was during the summer and early autumn of 1983, playing out his last season and leaving me to wonder what rooting for the Red Sox would be like without him. At that age, my fanhood was based solely on the identification with the players. The laundry hadn’t really come into focus yet because the turnover rate in my short window of rooting for the Sox was minimal; I was too young and disconnected to feel the pain of Tiant and Lee leaving, and merely impotently aware of Lynn’s and Fisk’s departures. At the same time, I was a virgin to the delicious thrill of a pennant race (I was only 7 in 1978 and couldn’t appreciate the story being spun out of that season at the time). What else was there but to root for this man who had embodied not only being a Red Sox, but also represented the honor bestowed in the fight itself, as opposed to the outcome? The funny thing is that for all my anxiety over Yaz’s impending retirement, it wasn’t like I was seeing anything remotely resembling his prime, as if I knew what I’d be missing. It’s just that he had Always Been There. Not just for me, but for my father. Particularly for my father. This worrying about my father’s feelings about any outside developments whatsoever was a shaky new concept. He was a sophomore in high school the spring that Yastrzemski made his debut, for Chrissakes, surely some bell must have been tolling in his consciousness. And if #8 was getting too old to hack it, then maybe so was my Dad, and then so would I at some point down the road. These aren’t things you want to think about when you’re 12. Yaz occupies a curious spot in the Red Sox pantheon. A first ballot Hall of Famer who may have been an accumulator more than anything else. Owner of a Triple Crown and a multiple Gold Glove winner, but a reclusive and somewhat aloof person who did little off the field to endear himself to the fandom. Very few kids my age even liked him during his playing days, as they thought he was some old fart whose presence was somewhat comical in contrast to that of Lynn and Rice, and later on, Evans. You look at some of his years and it’s not surprising, these sentiments: .254 with 15 home runs in 1971? .264 with 12 home runs in 1972? His renaissance perhaps coincided with the position change to first base, or with the rising fortunes of the team after its post ’67 doldrums, but as the ’70s progressed he became cagey veteran. Mortal or not, no man was more fearless and determined once he put on that uniform. He was the original Dirt Dog. Yet for all of that, he never won a ring, and to add insult to injury, he made the last outs of the ’75 and ’78 seasons, both with the Sox behind by a mere run (and in the case of ’78, with Remy on third). The Kid had the same “didn’t win it all” collar around his neck (and had lesser numbers in what would be considered the “clutch” times during his career), but he is not cast in the same light. To me, Ted was Zeus, hurling lightning bolts from on high. Yaz? He was Sisyphus. I learned about the myth of Sisyphus in 11th grade English and I immediately thought of Yaz. Then I extrapolated it out to simply being a Red Sox fan. But then again, none of us were actually rolling that rock up the hill. Yaz was. On the other hand, Yaz took a lap around Fenway Park the day before his last game, exchanging high-fives and handshakes with anyone lucky enough to be sitting in the first few rows. A far more stoic man than Ted ever was, he nonetheless placed himself into the open palms of Boston and said, “This is what I can offer you as thanks.” On his last day, as he walked off the field for one last time after being pulled during the top of the 9th, he unbuttoned his jersey and gave it to a boy in the front row behind the dugout before he descended down the steps for good. Carl Yastrzemski was not Superman or Zeus. But he showed us that a man battling against that which limits him — whether it was his own physical attributes or the unyielding opponent of time itself — is as compelling as any myth, while displaying far more honor.